We’re excited to let y’all know that the Women in Retail Leadership Circle will be back at Shoptalk this year, partnering again with The Female Quotient to produce a Girls’ Lounge, a welcoming and interactive space for women to come together, network and learn from each other. And the good news is that our Girls’ Lounge was so successful last year, Shoptalk has asked us to host it for two days at this year’s event. The Lounge will have prime real estate right in the exhibit hall! We’re super excited! Are you going to Shoptalk? If so, would you like to participate in any of these panel discussions? Please let me know by dropping me a line at mcampanelli@napco.com. Summit Dreaming The Girls’ Lounge @ Shoptalk Was a Huge Success! 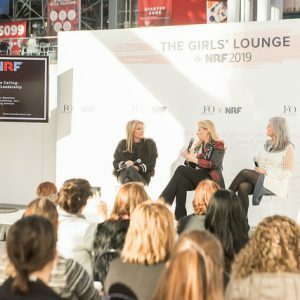 Women Rule at the NRF Big Show! Congrats to Chico’s FAS!